18" (13¾"x10¼") screen / 2½" CRT ! 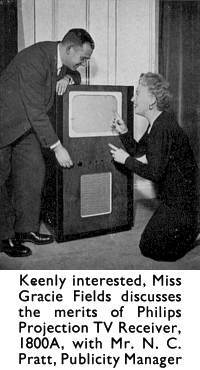 At the start of the 50's, 9" CRT's were just being replaced by 12" CRT's as being the norm. However there was (and still is!) demand for larger screen sizes. Glass technology was very much a limiting factor and so two approaches to large screens were adopted. One short-lived method was to make the cone out of metal (an axample being the Bush TUG26). Another even shorter lived method was that used by this set ... a projection system. The idea is to use a small CRT and then magnify its picture via a system of lenses and reflectors with the final image being projected onto a large viewing screen. The above diagram gives an idea as to how it works, although in this set the C.R.T. actually runs parallel to the screen. 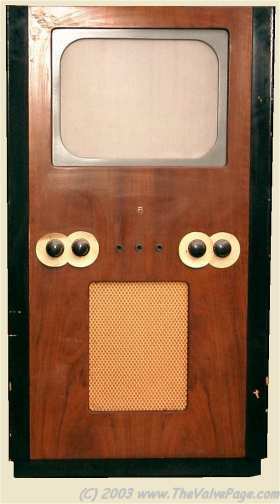 'H' (on the left) is the viewing screen at the front of the set. 'G' is a mirror that can be seen at the back of the set. The remaining mirrors and lenses (D,E,F) and the CRT are mounted in a special assembly. Now for the problem. When you magnify an image it appears darker. In this instance the display area is over 50 times the picture area of the CRT. Thus a especially bright CRT is required, step forward the MW6/2. 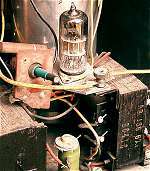 As well as using a special phosphor the tube also runs with an extremely high E.H.T. of 25KV ... remember, this is the era when 5-7KV was the norm. 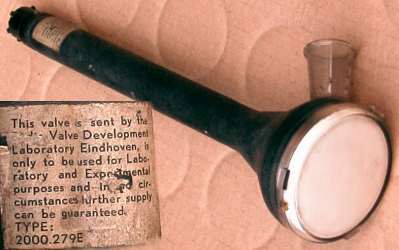 The EHT supply uses 6 valves. 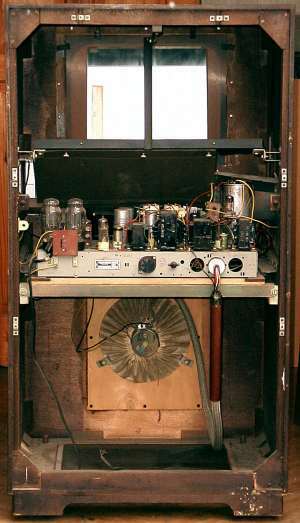 A UAF42 oscillator drives a PL38 which in turn drives a dedicated EHT transformer. 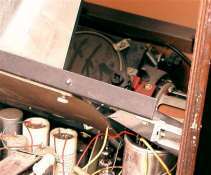 The output of the transformer drives a voltage tripler (with three EY51 rectifiers), and the circuit is supplied from its own personal PZ30 H.T. rectifier. These CRT's are being pushed to the limit and generally had a short operating life. In addition they could be easilly damaged ; for example loss of frame or line drive would very quickly burn a straight line into the phosphor and hence additional circuitry is included to shut off the CRT ander such faults. In this set the protection circuit is based around an EB91 double-diode valve which is lashed up on top of a transformer as if it were an after-thought. Many radio and television manufacturers enlisted popular entertainers to help publicise their products, Ultra using Arther Askey and Baird using Terry Thomas for exampe. However, with the 1951 opening of the Holme Moss television service "up north", Philips enlisted the services of the northern lass herself, Gracie Fields, pictured opposite. TheVintage Television Service Data CDROM. includes some service data for this set. 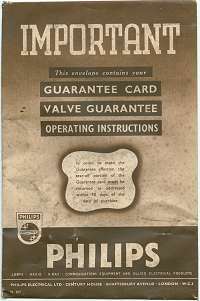 However the set also came with a rough but usable Philips service manual. New old stock !!! This set had rested in an old TV shop since it was new and may well never have been fired up. Over the years some of the valves had been robbed (suprise, suprise, both UL41's were missing) but these have now been replaced. The front controls still have their protective pices of paper behind them. In the back of set was the original envelope containing the user manual and various valve, CRT and overal TV guarentees. From the shop On The Air for £200. 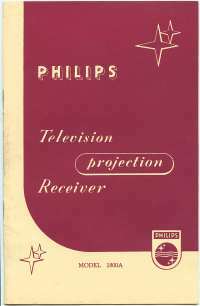 The subject of projection televisions was covered in an artical in the April 1950 edition of Practical Television magazine. Follow this link for a copy of the artical. 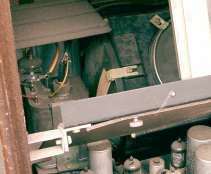 In addition you can find a detailed fully illustrated servicing guide for the projection unit (which was used in many sets of the era) here : Servicing the Projection Television System.